Sign up and receive Property Email Alerts of Houses for sale in Claremont, Cape Town. This beautiful home with modern design and finish is situated in the heart of the sought-after suburb of Lynfrae, in Claremont. This open-plan bright and sunny, north- facing home is situated in the catchment area of leading schools including Rondebosch Boys and Rustenberg Girls. Bairnsleigh pre-primary school is located in the same road. A short, five minute, walk from incredible outdoor and sporting facilities including Keurboom park, Western Province Cricket Club, Newlands Rugby/Cricket Stadiums. The property boasts a spacious open-plan lounge and dining room with wooden floors and a modern white stone Morso fireplace. The lounge has stacking glass doors, which open on to a deck overlooking the swimming pool. High quality safety pool net available. In addition to the wooden deck, there is a covered patio area with down-lighting overlooking the pool with majestic mountain views ideal for entertaining. A fully-fitted modern kitchen with gas hob, open-plan to lounge/dining area. Extra large main bedroom with ample built in cupboards, and attractive en-suite bathroom with shower and w/c. Main bedroom has French doors that open onto patio and garden, with scenic mountain views. Two further well-sized bedrooms with built-in cupboards and a family bathroom with large bath. Fully walled with electric fence, burglar alarm and automated gate. Easy to maintain back garden with Jungle gym and large tiled patio with mountain views ideal for entertaining. Single garage plus carport and further off-street parking for another two cars. Pre-paid electricity. Included are floating shelves, curtain rails and gas cooker. Excluded are all pot plants and fountain/water feature. 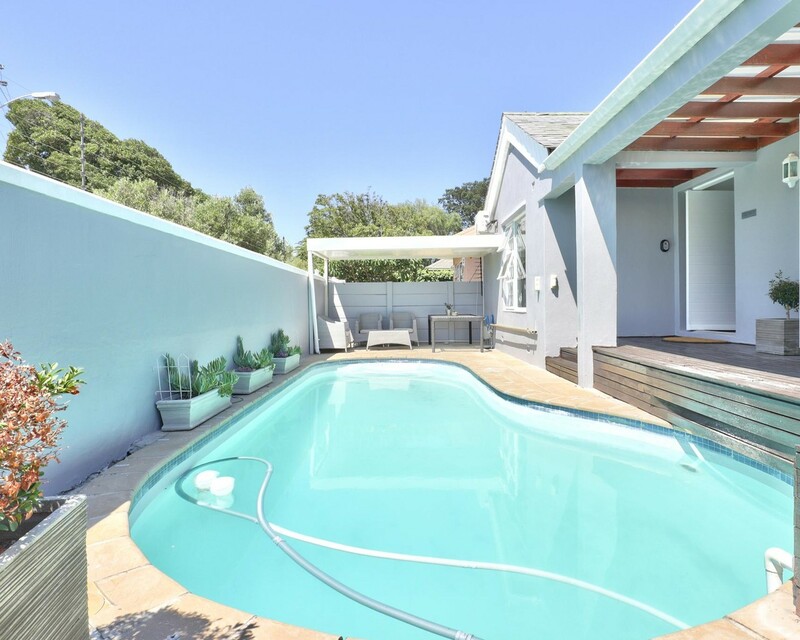 Sign-up and receive Property Email Alerts of Houses for sale in Claremont, Cape Town.